Yesterday I decided to go for a quick bicycle ride, which turned out to be a 42 mile trek. I have lamented about the lack of good bicycle routes in Bolingbrook, but did some thinking yesterday about a route to get onto the Centennial Trail right from my house. Well, it totally worked out great and I can even get onto the Cal-Sag trail too if I really wanted to pull an insane day of riding. This is also the first ride testing Strava on my Apple Watch. I have done a few rides now with the native fitness app, and I really like that a lot. The interface is great. I do miss Strava a bit though for the social integrations that is has. I'm not a premium user, so we'll have to see how I continue to use it or not. Overall it was a brutal, but fun ride. The weather was great in Illinois this past week. Highs were in the upper sixties all weekend long, which meant everyone was able to get outside. Megan and I both got out and enjoyed a quick ride at the nearby Centennial trail. It is a great afternoon ride that we have done on numerous occasions. It is an all paved bike path for about 13 miles. A section of the path that was closed and under construction for all of last year had just opened up and we were able to experience it for the first time. It was a nice six mile stretch on the I&M canal which had water on both sides of the path. It was really fantastic. We also had the opportunity to try out both of our fitness watches for the first time cycling. Her with her Apple Watch and me with My Fitbit Charge 2. Both worked out great, but there were a few hiccups along the way. Megan's Apple Watch has built in GPS, but it seems that the Strava app on it has not yet leveraged that. We left her phone in the car so we missed the first few miles of recording for her. Instead we used the watch's built in fitness recording and that ended up working out great without the phone. Lets hope Strava updates their app soon. On the Fitbit Charge 2, the connected GPS to my phone worked out well. 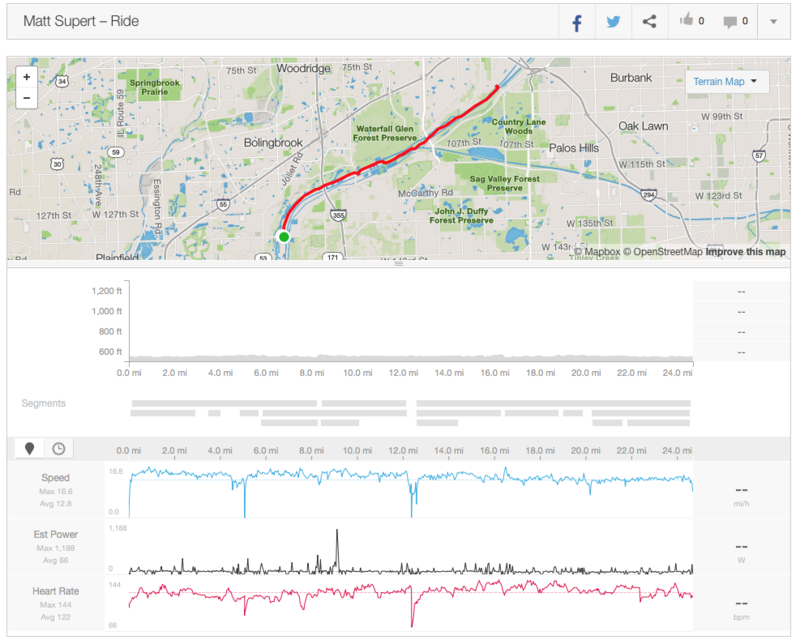 I had to record the route using the Fitbit app instead of Strava, but the data did push over to Strava in the end, including the heart rate data. Very cool and something I hope to use more of in the future. 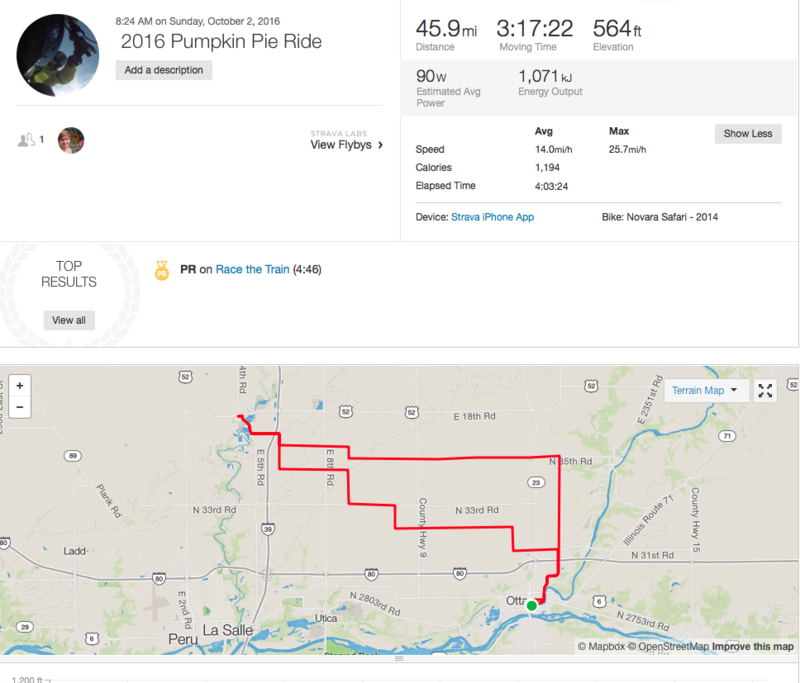 Fall is here and it is time for the Pumpkin Pie ride out in Ottawa Illinois. This is the second year that we have done the ride, but this year Megan had a true road bike. The weather could not have been better. It was about 65 degrees and overcast and we did the 45 mile ride. Megan did great and we had a really fun time. This is definitely going to be a regular ride for us.